Placed in command of the elite military organization known as XCOM, you and your friends must find some means to turn back an escalating alien invasion. As UFOs appear in orbit and worldwide panic threatens to undermine national governments, the game’s free companion app and its push-your-luck dice rolling mechanics immerse you deep in the tension and uncertainty of a desperate war against an unknown foe. The most notable aspect of XCOM: The Board Game is the way that it incorporates a free digital companion app into the core of its gameplay. The companion is easy to access, available both as an online tool or a downloadable app. Within your games, the app heightens suspense as it both coordinates the alien invasion and permits a dynamic turn structure, something that would be impossible without its use. As the department heads of XCOM, you and your friends must succeed where the world’s militaries have failed. You lead the elite members of an international military organization, which is funded by a secret coalition. It is your job to destroy UFOs, research alien technology, uncover the alien invasion plan, and find some way to turn back the alien invaders. You must do this all while preventing the collapse of the governments that secretly fund your organization, and you must do it quickly. You do not have the luxury of time. 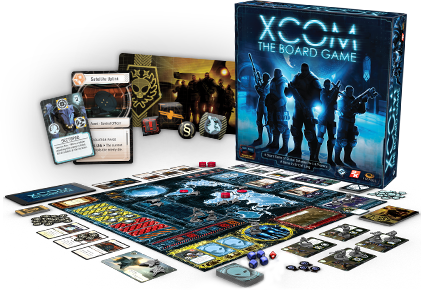 Each game of XCOM: The Board Game requires the cooperation of XCOM’s four department heads: Commander, Chief Scientist, Central Officer, and Squad Leader. Whether you play the game solo, with one friend, or with three, you must always include all four roles. Each department head manages a specific set of responsibilities, and each is vital to the world’s defense. The Commander is responsible for managing XCOM’s budget and must be foresightful enough to know when best to access the organization’s emergency funding and how best to allocate it. Additionally, the Commander makes the tough decisions about where to assign XCOM’s limited number of Interceptors to global defense. Wherever you commit your Interceptors, you have a chance of destroying UFOs and slowing the spread of panic. Wherever you don’t commit your Interceptors, fear and anxiety are bound to run rampant. If you and XCOM are to have any chance of successfully repelling the alien invaders, you’ll need better technology. The Chief Scientist’s responsibilities include studying advanced technology, learning how to harness it, manufacturing better weapons and armor, and equipping the rest of the organization with the tools they need to survive. Of course, only a limited number of scientists possess the necessary training and intellect to quickly dissect, analyze, and replicate alien technology. Part of your job as Chief Scientist, then, is not only to decide how best to direct the organization’s research efforts but also to prioritize between them, allocating more scientists to the projects you decide will best benefit the war effort. The Central Officer serves as the communications relay between XCOM and the outside world. This means you manage the organization’s satellite network, and it is your job to ensure that the organization remains alert to potential threats, communicates and coordinates its efforts effectively between branches, and scrambles as many alien transmissions as possible. Succeed, and you’ll reduce the number of UFOs in orbit. Fail, and you’ll suffer communications blackouts that will force you to act blindly in the midst of a extraterrestrial invasion, the likes of which Earth has never known. Additionally, the Central Officer communicates all of the information provided by the game’s digital app to the players. The clock is always running, so it’s vital that you share all relevant information quickly and clearly. In the end, XCOM needs boots on the ground to confront the alien invaders, and it’s the Squad Leader’s job to ensure that the right troops are tackling the right missions. As the invasion escalates, you must assemble strike teams to meet the aliens in battle. Simultaneously, you must assign soldiers to defend the XCOM base, and you’ll need to strike an effective balance. If your base falls, so do you. So does the earth. Still, you need to succeed at missions to win. Each mission you complete brings you closer to uncovering a means of launching one final, fatal blow against the alien invaders. To Confront an Unknown Enemy, You Must Enhance Your Troops. While you and your friends immerse yourselves into your roles as XCOM department heads, the alien invasion continues to escalate. XCOM: The Board Game incorporates the use of a free digital companion app, which you can either download or access online. By coordinating alien activities in real-time, this companion app heightens the game’s dramatic tension and its immersive qualities. Each round, the app tracks the time you have allotted to respond to each task, forcing you to think quickly, even as you must carefully measure the strategic implications of your decisions. However, the app does far more than track time. Its design is integrated deep into gameplay, and it permits both a mutable alien invasion plan and a dynamic turn structure. Two UFOs appear over North and South America. When you start a game of XCOM: The Board Game, the app selects one of five different invasion plans. These plans represent the different, overarching strategies that the aliens might employ as they send forces against the earth’s different continents, create catastrophes, and target your base, pressing back against your resistance efforts. Each invasion plan establishes a larger pattern for the aliens’ tactical use of three different game elements: UFOs, crises, and the enemies assigned to assault XCOM headquarters. Each round, UFOs appear in orbit, hovering over the world’s continents. UFOs that your Interceptors don’t eliminate spread fear through the continents that they menace, and if two continents fall into panic, your organization loses funding, your efforts are undermined, you fail to safeguard humanity, and you lose the game. Three UFOs end the round above Africa, increasing panic in Africa by three steps. One of the Commander’s responsibilities is to choose which crises XCOM forces respond to throughout the game. However, it is the app’s artificial alien intelligence that determines how many crises you’ll be forced to resolve. Each crisis is represented by a card in the crisis deck and will either set back your efforts or accelerate the alien invasion and spreading panic. To respond to the game’s many crises, you need to develop flexible plans. Even as you and your friends work to push back against the alien invaders, the aliens are sending troops to find and destroy the XCOM base. They recognize that your elite troops and scientific advances present the only real threat to their invasion. Depending upon the invasion plan, the app will dedicate more of the alien invaders to the destruction of your base. If they succeed, you lose. A Sectoid spawns on the XCOM base. Additionally, the app teaches you the game in its Tutorial mode and then allows you to choose from any of three different difficulty levels: Easy, Normal, or Hard. A Desperate War Requires You to Make Difficult Decisions. While humanity stands upon the verge of collapse, you have no room for failure. Once you formulate your response to the alien invasion, you must engage the enemy in an untimed resolution phase. Here, the push-your-luck dice rolling system in XCOM: The Board Game reflects the peril of your situation. Whether you’re resolving your base defense, attacking UFOs, or pulling all-nighters in the lab to upgrade your tech, you’ll need to succeed at a number of dice rolls. Your dice pool is generally equal to the number of resources you’ve committed to the task. For example, you get one die for each Interceptor you’ve committed to combat the UFOs with which it’s engaged, or one die for each scientist working on the research you’re attempting to complete. Similarly, you get one die for each soldier assigned to your base’s defense; however, you roll an extra die for each soldier who has received officer training and an extra die for each soldier whose skills match those indicated by the icons on the alien you’re aiming to defeat. XCOM: The Board Game comes with four XCOM dice and one enemy die. Xenobiology requires two successful research results. Each success rolled by the satellites assigned to orbital defense destroys one UFO in orbit. Each success rolled by the Interceptors assigned to global defense destroys one UFO with which it’s engaged. Each success rolled by the soldiers assigned to base defense damages an enemy, and if the enemy suffers an amount of damage equal to its health, it is killed. Each success rolled by the scientists assigned to a research task adds one success token to the task. To complete their research, the scientists need to earn the number of success tokens indicated by the task. Each success rolled by the soldiers assigned to the current mission adds a success token to the mission. To complete a mission, the soldiers need to complete three tasks, each of which requires the soldiers to earn a specific number of success tokens. Obviously, you want to roll successes. The twist is that there’s only two successes indicated on each die. Thus, you’re likely to need to roll multiple times in order to succeed, and this is where the game’s push-your-luck aspect comes into play. Each task has a threat level that starts at “1,” and even as you roll your pool of blue XCOM dice, you roll a single red enemy die. So long as the result of the enemy die is higher than the task’s current threat level, you can choose to reroll all the dice in your pool, both the XCOM dice and the enemy die. In this way, you can continue to mount your desperate defense of humanity, even as the aliens intensify their efforts. You can attempt tasks multiple times, but you must increase the task threat each time. Each time you push in this way, you increase the task threat by one step. So long as your keep rolling results on the enemy die that are higher than the task threat level, your XCOM soldiers maintain the good fight. However, if the result of the enemy die is equal to or lower than the current task threat level, you start to suffer losses. You’ll lose soldiers or Interceptors. Your satellites may go offline. Your scientists will suffer fatigue or succumb to alien diseases and won’t be able to continue until they’ve recovered. The stakes of XCOM: The Board Game are as high as they come. The very existence of human civilization hangs in the balance. There’s no room for error, but you’ll need the wisdom to pick your battles. And, sometimes, you’ll need the courage to cut your losses. Can you complete your final mission and save humanity? With its distinctive player roles and free companion app, XCOM: The Board Game evokes all the fear, desperation, and heroism that lie at the heart of the popular and acclaimed XCOM computer games. All the while, it immerses you in a wholly unique play experience. The copyrightable portions of XCOM are © 1994-2014 Take-Two Interactive Software, Inc. © 2014 Fantasy Flight Publishing, Inc. Take-Two Interactive Software, Inc., 2K, Firaxis Games, XCOM, and their respective logos are trademarks of Take-Two Interactive Software, Inc. The FFG logo is ® of Fantasy Flight Publishing, Inc. All rights reserved to their respective owners.